Both these devices are designed with durability in mind. 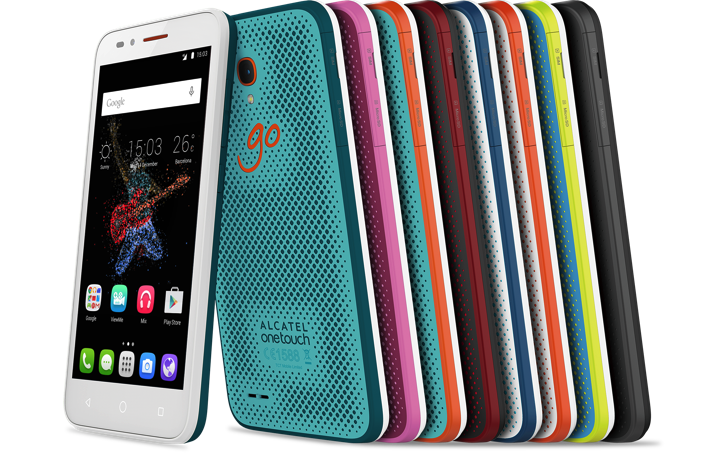 The GO PLAY is IP67 rated and comes in 8 colors. It's also shock-proof, so it can handle the occasional drop. The water-resistant design also allows the phone's 8MP camera to work underwater. It has a 5-inch 720p display and inside you'll find a Snapdragon 410, 1GB of RAM, and 8GB of storage. It's clearly meant to be an entry-level device. The non-removable 2500mAh battery allegedly offers up to 500 hours of standby time. The GO WATCH is also IP67 and shock-proof. It looks... interesting. That's a very generous term. Many would call it ugly, but I'm trying to look on the bright side. It has a Cortex-M4 SoC and a 225mAh battery that's good for 2-5 days of use when paired with an Android or iOS device. It's not Android Wear, though. It's running the same OS as the previous Alcatel watch. Pricing and availability weren't announced for either device.